Using enums can come in handy in many situations. 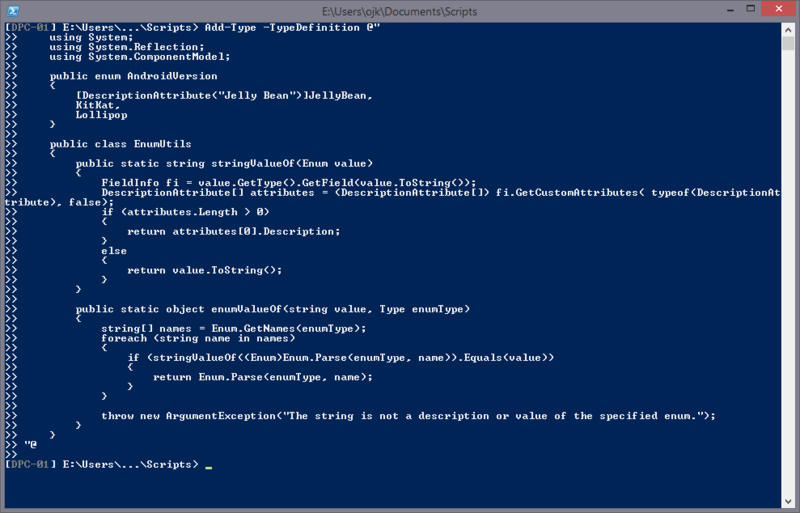 When writing an advanced function in PowerShell, using an enum as the parameter type will ensure that only valid values are used, as well as give you tab-complete functionality (The same can be achieved using ValidateSet). Now, I was working on extending my Mockaroo function when I found myself in a position where I needed to validate a large amount of values for a parameter. I decided on an enum, but I had problem – some of the values where strings with spaces in them, and I was going to use the parameter value when creating a URI for the Mockaroo API, so I’d rather avoid using a huge switch-statement translating the enum values to strings. Clearly that didn’t work. And enclosing the enum in quotation marks won’t help either. So how can we get around this? Well, I didn’t know so I started to research, and I found a solution created by Wayne Hartman in c#. He created a helper class called EnumUtils that have two methods; ‘stringValueOf’ and ‘enumValueOf’. All we have to do is to add a Description Attribute to the enums when declaring them. Let’s test it out. Great, no error messages. Let’s first try to get the enum value of JellyBean the normal way.